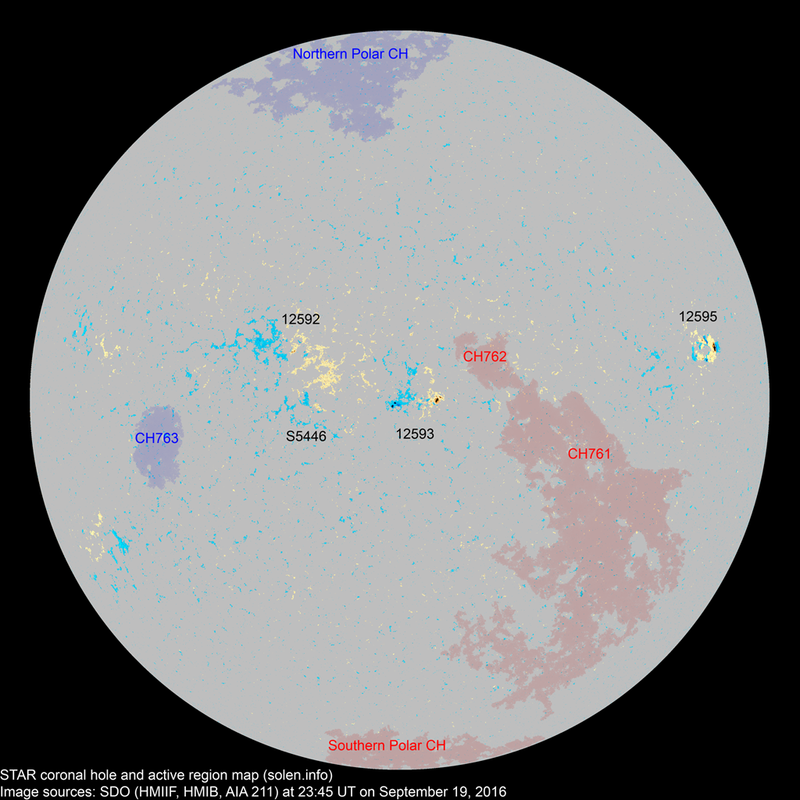 Last major update issued on September 20, 2016 at 03:50 UT. The geomagnetic field was quiet to unsettled on September 19. 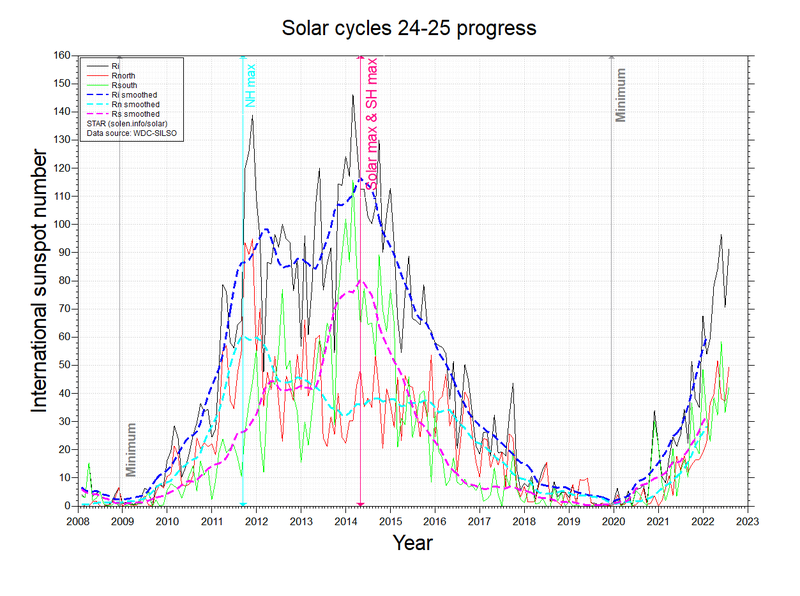 Solar wind speed at SOHO ranged between 316 and 600 km/s. 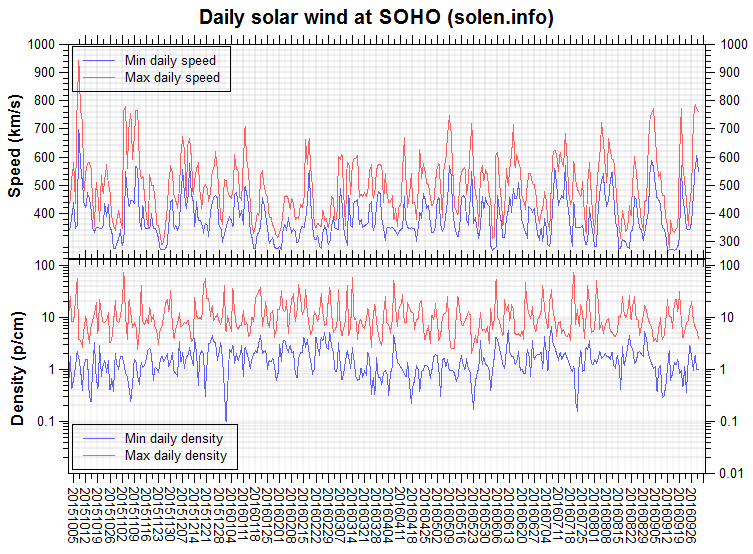 A high speed stream associated with CH761 became the dominant solar wind source after noon. 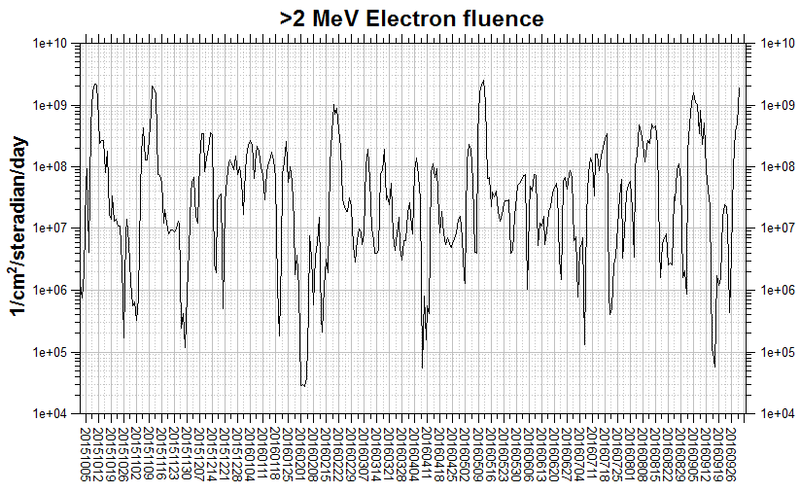 Solar flux at 20h UTC on 2.8 GHz was 82.6 (increasing 1.3 over the last solar rotation). 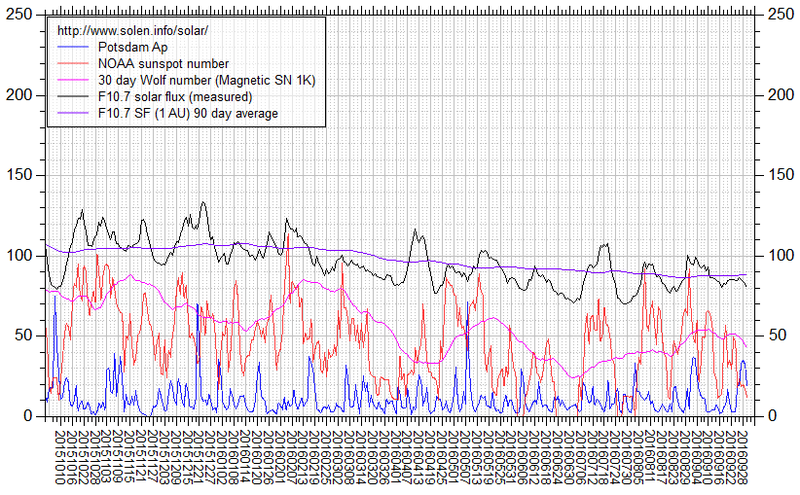 The 90 day 10.7 flux at 1 AU was 87.6. The Potsdam WDC planetary A index was 8 (STAR Ap - based on the mean of three hour interval ap indices: 7.8). Three hour interval K indices: 11222213 (planetary), 11332323 (Boulder). 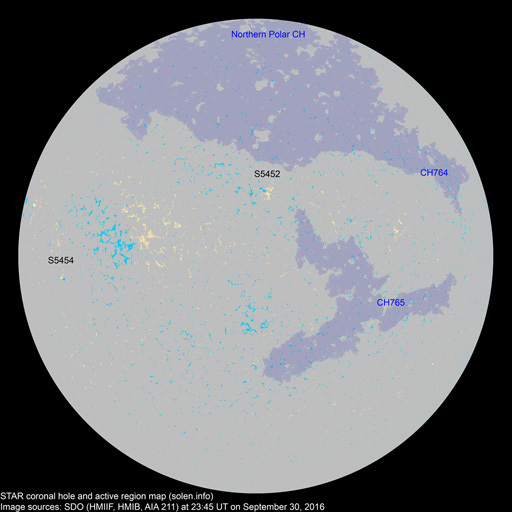 At the time of counting spots (see image time), spots were observed in 4 active regions using 2K resolution (SN: 80) and 4 active regions using 1K resolution (SN: 61) SDO images on the visible solar disk. Region 12592 [N14E16] decayed slowly and quietly. Region 12593 [N07W03] displayed signs of decay and was quiet. 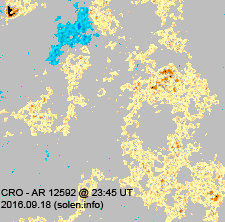 New region 12595 [N12W58] emerged quickly and has minor polarity intermixing. C flares are possible. S5446 [N07E16] was quiet and stable. A recurrent southern hemisphere coronal hole (CH761) rotated across the central meridian on September 15-18. 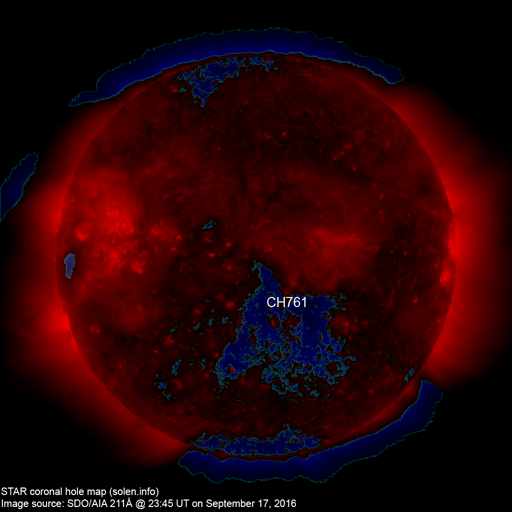 A new coronal hole (CH762) has formed in the northern hemisphere and was in an Earth facing position on September 19. A recurrent coronal hole (CH763) will likely rotate into an Earth facing position on September 22, CH763 has decayed significantly over the last solar rotation. The geomagnetic field is expected to be quiet to active on September 20-21 due to effects from CH761 with a chance of minor storm intervals on September 20. Quiet to active is possible on September 21 due to a high speed stream from CH762.